BOOK REVIEWS, RECOMMENDATIONS, & NEWS. 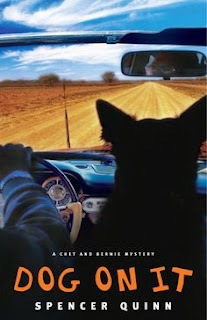 Dog On It by Spencer Quinn is a detective novel with a twist. Chet and Bernie are partners in the Little Detective Agency. Each has his strong points. Bernie is the thinker. Chet is intimidating, if need be, and has a knack for smelling out criminals, literally. Chet is a dog. He’s also the narrator of the novel, which makes for a totally unique and fun read. Chet’s wry commentary is hilarious, like when Bernie asks Chet if he needs to go out after being inside all day. “Why would that be?” Chet thinks to himself. “Just because my back teeth were floating?” The Chet and Bernie mysteries are a series of books, Dog On It being the first volume. In this particular assignment they’ve taken on, Bernie and Chet are hired to find a missing teenager. The duo work diligently together to solve the case. All the while, Chet’s perspective of the human and canine worlds kept me smiling throughout the book. If you’re looking for a fun, light read this may be the book for you. You might look at your pet in a whole new way afterwards and wonder—Just what is he thinking about? Well this book has been in my stack of books for awhile now and I think it will get moved up to the top. Thank you. It sounds fun, just what I like! Yesterday, my sister sent me a link to an article about a woman in Coeur d'Alene who turned a 100-year-old tree stump into a Little Free Library and I just had to see it for myself. The article stated that the tree was dying, rotting on the inside, so they had to have it removed. When some people have trees cut down they leave a large section to turn into wood sculptures. I love to see the works of art that are created from those stumps. But this stump takes the cake. Instead of a sculpture, owner and artist, Sharalee Armitage Howard, turned her tree stump into the most magnificent Little Free Library I’ve ever seen!